I loved fingerless mesh gloves. Fingerless gloves. We all had them. If you say you didn't, you're a dirty liar. Neon pink or green mesh fingerless gloves were all the rage in the mid 1980s. Paired with a neon top and rubber bracelets, I felt so cool and stylish. I'd spike my hair and put on my cutest new wave earrings. 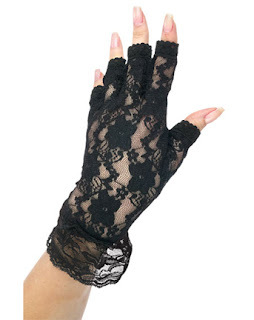 In addition to the mesh gloves, I also loved my Madonna style lace fingerless gloves. Did you or your sister have a pair? I promise you that I never owned or even wanted a pair! I didn't have any of these... :) Skip on back to the 1970's and I might have had a cool pair of waffle stompers or something, but never did I have a pair of those fashionable gloves. Hi Ally! I didn't have any and now feel as if I missed out! I never had them, but my kids were really into them last year.